Hi everyone! I hope you all had a wonderful weekend and start to the new week. I just want to say, thank you blog friends for coming to visit me and for leaving comments all the time! A big THANKS also to each and everyone of you that come and link up your lovely projects each week at our Monday Cooking and Crafting with J & J Link Up. We really appreciate your loyalty, support, and creativity! I recently entered a giveaway that Kim from Exquisitely Unremarkable had for her three year blog anniversary. I was so pleasantly surprised to find out HERE that I was the WINNER! I had to look at her email twice because I was so shocked and surprised that I had won her gorgeous spring bag that she was giving away! I found this lovely thank you card when I opened up the box. I have already filled the bag up with my crochet project (a crochet scarf) and my crochet/knit supplies and it's ready to go for my next crochet meeting, which is today! I will enjoy using this beautiful spring bag and thanks again Kim for your lovely giveaway. If you all have a chance, please visit Kim's lovely blog Exquisitely Unremarkable as she just celebrated three years of blogging! Kim loves blogging about home decor, crafts, and recipes. What I love most about her blog is that all of her projects are fun and easy to make. I hope you will visit and enjoy her blog just as much as I do! I also want to say a big thank you to Ping who blogs at Living This Chic Life where she loves blogging about recipes, life, and travel. Ping enjoys cooking, and has made a few of my recipes that I have shared on my blog. 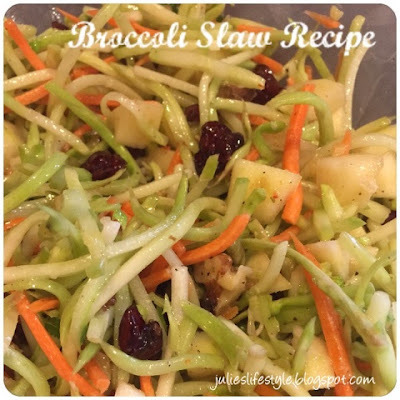 Ping recently made the broccoli slaw salad recipe that I shared with you all back in November. The broccoli slaw is also from Trader Joe's, but you can purchase it from a different store if you don't have one in your area. To see my recipe you can click HERE. To visit Ping's blog Living This Chic Life and to see how she made her salad, just click HERE. Thanks Ping for making the broccoli slaw salad recipe, as it makes me so happy to have you enjoy some of my recipes! If you have a chance, please visit Ping and her lovely blog. Congratulations Julie.. What a beautiful, spring bag. Just perfect for keeping your handwork in! And that broccoli salad looks like a wonderful addition to any meal. I'll have to try it. Happy spring and have a wonderful Easter. And thank you for hosting your lovely party! I join in when I can but I always love to visit! 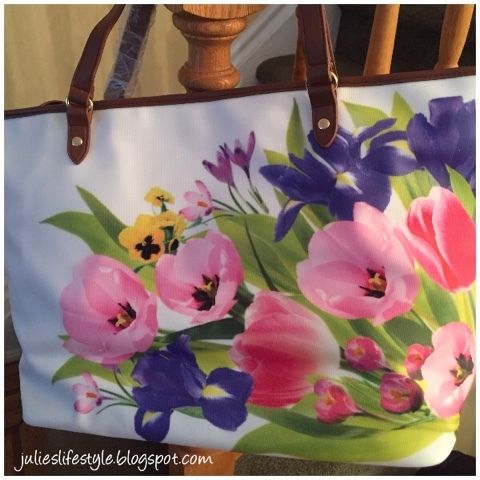 That is a beautiful bag Julie!! Congrats!! Congratulations! 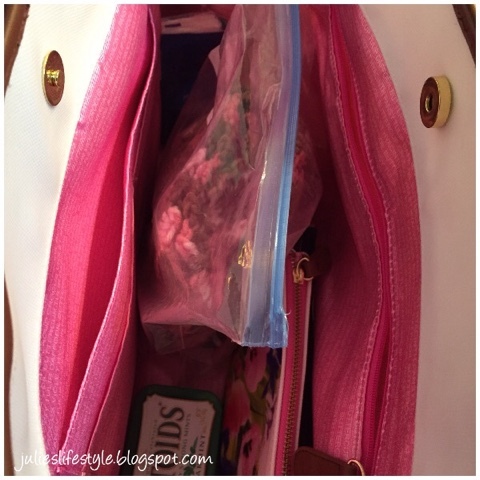 What a perfect bag for spring! That broccoli slaw looks good, I always buy that when I go to TJ's! Whoohoo! What a gorgeous bag!! Congrats Julie, the bag is just gorgeous, roll on Spring. Awesome! You found the perfect use for it too. Enjoy! Congrats Julie. The bag is gorgeous. I am sure you will put it to good use. Happy Spring. What a pretty bag! Perfect for toting your many projects. I will have to visit the lovely blogger who gifted it to you. Congrats on winning such a wonderful prize! Thanks so much for visiting!! 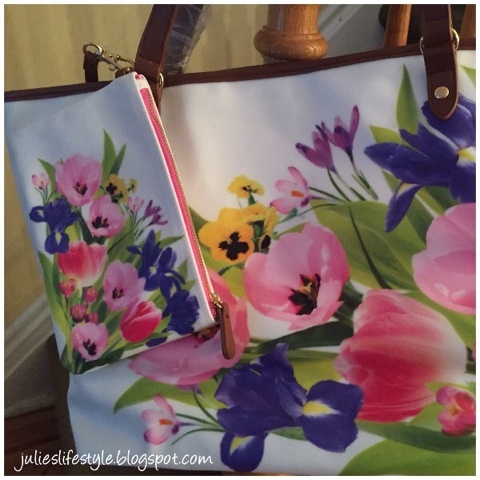 Such a pretty bag Julie! So glad you won it, and it's perfect for your supplies. Congrats! Congrats on the sweet little bag-Kim is a doll and I am happy for you! I am so envious! Congratulations! I thought that bag was gorgeous when I saw it on Kim's blog. What a lovely bag, well done on your prize. Congratulation Julie, what a beautiful bag :) It is such a great feeling winning something isn't it? Happy Easter Julie, thanks for stopping by the weekend blog hop..